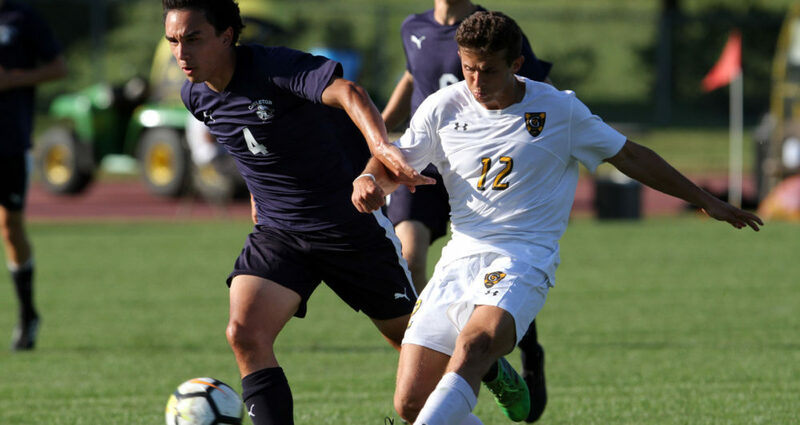 MOORHEAD, Minn. – The Gustavus men’s soccer team completed a 1-0 shutout victory over Concordia on Saturday afternoon, improving to 5-1 overall and 2-0 in the Minnesota Intercollegiate Athletic Conference. After a scoreless first half that saw the Gusties outshoot the Cobbers 8-4, Léon Equinet (Fy., Bonn, Germany) recorded his first collegiate goal at the 71:28 mark, assisted by Matt Gibbons (So., Minneapolis, Minn.) which proved to be the game-winner. Anders Severson (Sr., Woodbury, Minn.) posted his second shutout in a complete game effort. He made two saves. The Gusties outshot the Cobbers 16-7. Gustavus next travels to La Crosse, Wis. on Wednesday to take on Viterbo at 4 p.m.